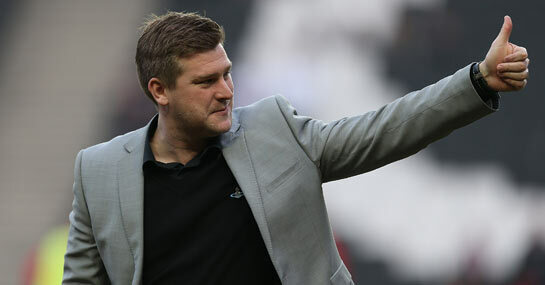 After delivering back-to-back top-six League One finishes with MK Dons in his first two seasons as a manager, many were surprised to see Karl Robinson remain at the helm of the Milton Keynes outfit last summer. And despite the Dons finishing outside the play-off places for the first time under his stewardship this season, it would appear that the 32-year-old’s stock has never been higher. Recently available at 6/1 to take over at Wigan, Ladbrokes have been forced to trim the former Everton trainee to 9/2 amidst a flurry of bets upon him taking the Latics reins. And the regard that Wigan chairman Dave Whelan holds his soon-to-depart manager Roberto Martinez in could in fact aid Robinson’s cause in landing the post, amidst his similar profile to the ex-Swansea chief. Indeed, Whelan secured the services of a then 35-year-old Martinez after an attractive playing style brought League One success to the Swans, and the Latics owner has since gone on to proclaim him one of the top 10 coaches in world football. Thus, it is reasonable to suggest that he will adopt a similar approach to finding Martinez’ successor, and the up-and-coming Robinson, a known believer in pass-and-move football, seems to fit the bill perfectly. The Stadium mk boss has already distanced himself from a number of managerial vacancies in recent times, turning down the opportunity to speak with Blackpool back in January and declaring his disinterest in the Sheffield United post less than a fortnight ago. But the chance to join the reigning FA Cup champions could very well prove an irresistible prospect for a man who was once the Football League’s youngest manager. Robinson has previously outlined a burning desire to manage at the highest level possible, and with the patient Whelan’s backing, could realise that ambition by delivering Premier League football back to the DW Stadium.